SANFORD, Fla. -- The Sanford Police Department in Florida will have to fix some of the damage to one of their patrol cars caused Monday morning by some monkey business. 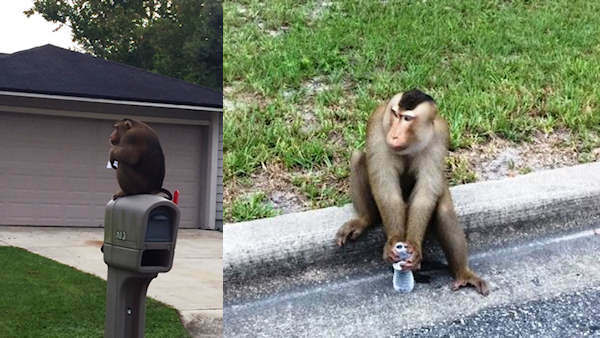 A resident of Sanford called police shortly after 8 a.m. to report that there was a monkey eating their mail, police said. The Sanford Police Department recounted the incident on its Facebook page, posting photos and video showing Zeek climbing on a traffic sign and then the police vehicle. "When we arrived to help the monkey, later identified at Zeek, decided to pull off molding from one of our patrol cars," the police department said in a post. One of the videos shows the monkey sitting on top of a navy sedan, which did not have any obvious police department decals or lights typically seen on squad cars, though Zeek did find something to pull off. In the end, it was a different piece of plastic that apparently saved the day. "We were able to distract Zeek with a bottle of water until his owner came and retrieved him," the police department wrote.